SUMMARY: Many marketers are building libraries of quality content, but how can those assets be translated into improved key performance indicators? Serving dynamic content recommendations on a website based on visitor analytics is one way to improve the quality of content visitors see. 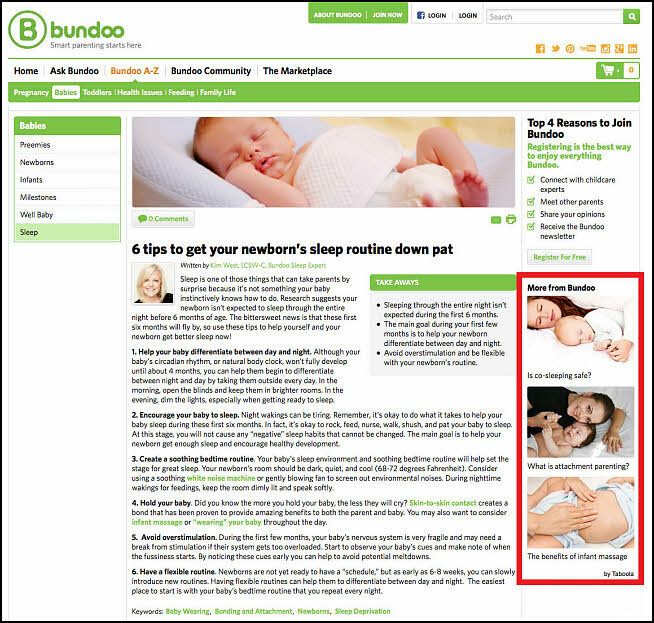 This case study looks at how new parent resource, Bundoo, used data points including user behavior, location and social media trends to dynamically serve its website visitors relevant content. This campaign resulted in increased time on site of 70%, a 25% improvement in bounce rate and 45% more pages per website visit. Stephanie Winans, Chief Operating Officer, Bundoo, said the website received a lot of referral traffic through online publishers, social media and organic traffic and that those users were highly engaged. However, at the same time, there was a temptation for those visitors to return to the referring app or social platform, so bounce rate was an issue for the team. Another marketing issue that Winans described as more of an opportunity was taking advantage of its extensive content offering to reach its target audience. 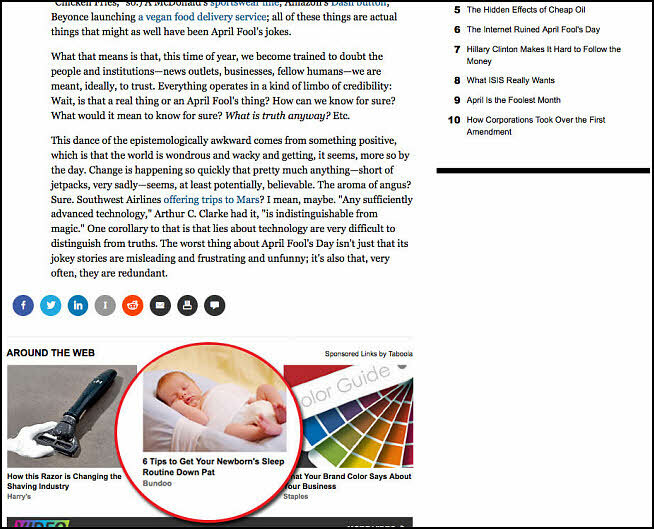 She said Bundoo's marketing was focused more on content than "generic brand advertising." To address both of these issues, the team added a third party platform to the website that delivered dynamic content optimized through visitor analytics and, in the process, improved its website key performance indicators across the board. A key reason the team was interested in maximizing its content was that other SEM campaigns were successful but expensive. Keywords in Bundoo's space are competitive with big budget enterprise companies — such as large pharmaceuticals — bidding on the same keywords. The team also ran social media advertising, but faced higher bounce rate through those referrals. Winans said, "We were really looking for a way to drive people to our content where it was not expensive, but high quality ... it felt like we had one or we had the other." The third party platform the team deployed on the website takes up eleven spaces of website real estate — eight on the bottom of the page and three on the side, with nine spaces reserved for Bundoo content and two more that are sponsored and used by Bundoo for revenue generation. In terms of reducing website bounce rate, Winans said the team focused on the nine Bundoo spaces. She explained, "It's recirculating Bundoo content, not based on what we at Bundoo think may be relevant to the reader who is reading this article but based on other things that they've been doing on the Internet." The platform uses social media trends through a process known as "collaborative filtering." This is similar to the process found on ecommerce websites that offers recommendations such as, "other people who looked at this product also purchased this product." One step the team took was tracking metrics such as time on site and, when a particular piece of content performed especially well, the platform would offer variations of that content to reduce bounce rates even further by offering the same content within the platform using different images or titles. To optimize these variations the team would monitor the combination of thumbnail images and titles used for each piece of content and measure for the lowest bounce rate. Winans said high performing content was also taken into account when producing new content pieces. "When we see that things are performing really well, the first thing we do … is send our editorial team an email and say, 'Hey, you need to produce more content on this subject,'" Winans said. Another area of improving content recommendations came from tracking platforms — desktop, tablet and smartphone — to find out which visitor was spending the most time on the website. The analytics used to reduce bounce rates on Bundoo's website were also applied to Bundoo's online advertising using its content to draw relevant traffic back to the site. While the platform was delivering dynamic content to Bundoo website visitors, it was also delivering Bundoo's content on other websites such as USA Today, Business Insider and The Atlantic, driving visitors back to Bundoo. Winans said, "[The platform] reaches people who are most likely to be engaged with our content, which is obviously every publisher and brand's dream — to find these people that are most likely to be loyal and core users on even that first visit." She added, "When people find our content presented somewhere else on the Web and they clickthrough, they're either clicking through the [platform's] recommendations to find another article or they're interested enough in Bundoo to just poke around the rest of the site." Winans said a major takeaway was that marketers can never anticipate what will resonate with their target audience. She said she was 100% in the Bundoo demographic, but about successful content she said, "If you asked me a year ago which ones would be what we call in the office 'heavy hitters,' I would not have nailed them." She continued, "It does give us insight into not just what people are reading, but what content really resonates with them, and we use it for other marketing programs as well with choices of different types of content to promote."